CREAG MEAGAIDH is a spectacular mountain at any time of year, but under deep, fresh snow its charms are multiplied tenfold. The great walls that enclose the head of Coire Ardair take on an even more ferocious look, the black ramparts almost pulsating against the slashes of white which fill in every gap. Massive cornices hang precariously, and the steep rise to that famous nick in the skyline, The Window, is transformed into a serious winter ascent. This circuit of the ‘crag of the boggy place’ is a perennial favourite but I wanted to see this grand massif from a different perspective, a traverse from the west, coming in over that other awesome winter beast, Beinn a’ Chaorainn. This means a finish some six miles from the starting point on the A86 but I managed to team up with two like-minded souls to sort out the transport problems and make it happen. We started out early on a cold but clear morning, taking the forest track in from Roughburn, already kitted out in full winter uniform. It felt like overkill in the enveloping warmth of the trees but we knew it wouldn’t last long. The benign conditions at ground level were a fraud; the views all around revealed snow-laden peaks under brooding skies. The sweat built up from the from the initial push was soon lost as we emerged on to open ground and into a fierce north-east wind. Less than 20 minutes later, we were being pushed sideways by the wind which was whipping across the ice-blasted rocks on the open slopes of Beinn a’ Chaorainn, spindrift stinging and dancing with gleeful malice as if delighted to see us struggle to walk in a straight line. Onwards and upwards, but nearly almost sideways like Saturday night drunks, with glimpses of blue sky and cotton wool clouds on the horizon luring us on, the snow cover starting to fill in more and more of the gaps. Rays of sunlight penetrated the black at our rear, beautiful and threatening at the same time. Then we saw our first objective, the South Top of Beinn a’ Chaorainn, Great care must be taken on this triple-topped Munro, the line between the summits from south to north blurred by the unblemished white cover, the huge bites out of the skyline heavily disguised, lying in wait for the unwary to step through. This area is no stranger to accidents. A previous winter encounter here in zero visibility provided one of my most satisfying mountain experiences, dog-legging carefully around these hazards, counting my steps to perfection. The satisfaction, I hasten to add, was combined with a great sense of relief that my navigation lessons had paid off when it really mattered. There were no such problems this time. The route ahead was clear, the next two summits easily distinguished as the highest bumps under the white blanket, the danger areas between the peaks easier to avoid. The cornices are hypnotically beautiful, perfectly pure, not a blemish or a footstep to be seen. There was a little part of me wanting to explore that virgin snow, to see just how far in the cornices reached, but the stakes in this game of Russian roulette would be far too loaded. Best just to admire from a safe distance. 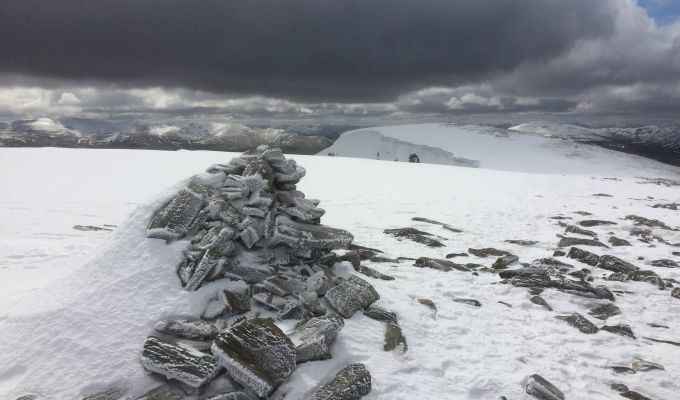 The sky was broiling black and snow flurries were stinging our faces, but the cloud remained high and we were soon standing at the ice-blasted cairn of the main summit. Creag Meagaidh lay to the east and the north-east, from this angle a shapeless mass of white which filled the horizon, its spectacular cliffs and corries under wraps for the time being. We trekked ankle-deep round the next curve to the North Top, the cornice again making sure that views into rugged Coire na h-Uamha would have to stay on hold for a bit longer. There was no sign either of the cairn on this top. It was buried deep beneath the snow, but with good visibility we didn’t need it as a marker to make safe passage to the Bealach a’ Bharnish. In poor visibility, the narrow line on this ramp between Coire na h-Uamha and Coire Buidhe could prove tricky to locate, but if in doubt there’s always a safer option by staying north for longer until an eastern turn can be made with confidence. There is an extra height loss but at least it’s a surer bet for safety. Our drop to the bealach was envigorated by the constant view into Coire na h-Uamha, in particular the rocky east ridge which provides a good scrambling route to the main summit for most of the year. In conditions like today, however, with its rock steps a funereal black showing menacingly under a scraped and scoured coat of white, it becomes a much more serious proposition. So far, the stroll down the ramp had been trouble-free, but what happened next highlighted how easily things can go wrong. The three of us were walking a short distance apart. I was in the middle, turning round every so often to see that we were still a three. We were all in plain sight of each other, but the snow was deep, the chill biting hard and the wind was muffling every sound. Talking was not an option but we were moving along at a brisk pace. Then the backmarker stopped for a toilet break and to put on another layer, but the front man kept going. I suddenly became piggy in the middle. Within seconds I had lost sight of both. I hung back a bit but then thought it better to try and catch the leader. Unfortunately, he then started to go off line, looking for a temporary shelter spot. As I caught up, I looked back to notice the third member now disappearing into the mist trying to find us on the original line. Our shouts were lost in the wind and he continued away from our position, so I set off to catch him before he vanished. 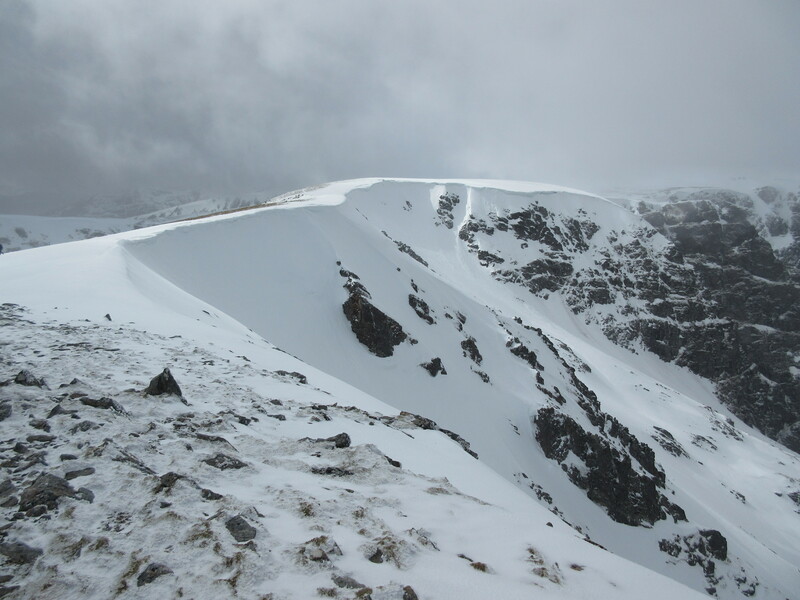 The momentary confusion over, we now continued the long ascent of Creag Meagaidh on open slopes through increasingly deeper snow. We were again walking beneath wonderful skies, black, bubbling and threatening one minute, fluffy white balls of cotton fleeing across a sea of azure the next. Small flurries of snow and hail kept blowing in but without any real conviction – it was as if they were just reminding us of their territorial rights in this savage landscape. We were following a fence line uphill, the posts varying in height depending on the snow depth, sometimes only the head having managed to break the surface. Behind us, Beinn a’ Chaorainn was now lit beautifully by the low winter light, three summits in perfect profile above their plunging corries, the ramp we had taken down so obvious from this line of sight. We snow-ploughed on, rising all the time on a ridge of ever-decreasing width. It would be easy to be lulled into a false sense of security on this broad rise, but as the summit cairn comes into view the terrain squeezes in like a model’s waistline with big drops on either side. It’s typical of Creag Meagaidh, a vast and complex octopus of a mountain with long sections of flat plateau intercut everywhere by huge corries, long ridges and soaring cliffs ringing most entrances and exits. It has more in common with its distant Cairngorms cousins than its rockier, more simply defined near neighbours, a dangerous place in whiteout conditions. The one minor obstacle in the way to the cairn was a six-foot deep snow drift which temporarily cut off our view of Beinn a’ Chaorainn, our constant companion over the past couple of hours. The view ahead was now completely white, an all-enveloping duvet thrown over every feature. As we left the summit, we met a party coming the other way, tiny dark figures in the palest landscape. They had needed crampons for their passage up through The Window, the nick in the skyline which allows access for the ascent to the main plateau from Coire Ardair. In summer this is a steep push up from the lochan through rubble and shifting scree but when covered in hard-packed snow it can be treacherous, an ascent requiring winter skills. It demands respect. 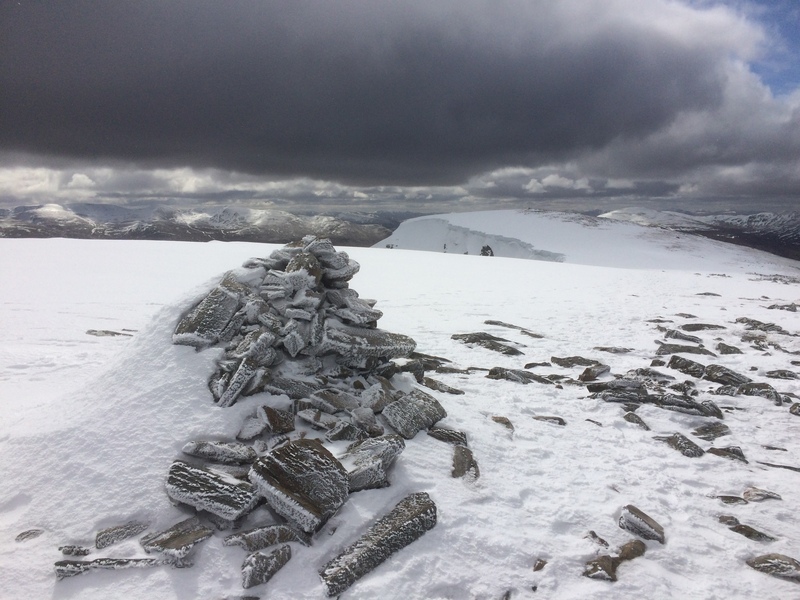 We passed the chaotic Madman’s Cairn, even its sprawling height and breadth shrunk by the massive snow cover, and then came decision time. Should we descend by The Window or stay high as long as we could and follow the right-hand ridge down? We picked the latter option but this meant another careful navigational squeeze, this time between Puist Coire Ardair and the plunging cliffs of the Moy Corrie on to the Sron a’ Ghoire ridge, another link that could prove a nightmare with limited vision. Driving snow showers added to the Alpine feel of the walk, our corries vanishing and then re-appearing as the light shifted and reshaped the landscape, the walking continually lop-sided as every step became a lottery as to how far we would sink. Mercifully, this eased as soon as we started climbing, moving onto rockier, more ice-shaped terrain. This ridge provides the ultimate in Window shopping, a superb eagle‘s eye view of this prominent V-shaped gap on the skyline and an appreciation of its steepness which is not always obvious when approaching from the corrie below. The gradient of ascent seemed to intensify with every step along the ridge. The massive cliffs all round were topped by waves of snow, giant quiffs in a form of suspended animation, hanging perilously above the black and white streaked ramparts, looking as though the merest breath could bring them crashing down with a fury belying their beauty. It was a mountaineer’s dream, this constant unveiling of the Coire Ardair faces standing guard over the dark ink well of freezing Lochan a’ Choire far below. The water nestling at the feet of these titans was moving through every shade of blue in a matter of minutes, but it never looked finer than when mostly starved of light, conjuring up visions of a dark, bottomless pit from which there would be no chance of escape once in its depths. We took a short stop before the next rise on the ridge for a short food break, but I think we all knew that the more likely reason was to slow the descent and drink in the sheer magnificence of what we were seeing. Everything soared, nothing was insignificant. Ridges and faces reared up on all sides, the cliffs glistened in the light and then darkened threateningly as the cloud base lowered for its 15 minutes of fame. We were reduced to mere specks, mortals in the realm of the gods, but we felt privileged to be here to salute their glory. Across the corrie, the long ridge containing the other two Munros on this circuit, Stob Poite Coire Ardair and Carn Liath, seemed to be going through the same emotions. Sure, these hills had caps of snow but the inferiority complex was clear. There was no doubt where the real power lay. They were a mere sideshow. Tempting though it was to linger longer, the cold and the reality of getting down before darkness meant we had to get moving. We could have followed the ridge down to its end, but that would involve crossing waterlogged ground – Creag Meagaidh is not named the crag of the boggy place for nothing - and then the river, probably on icy rocks through fast-flowing water. I had come to grief here before, slipping off the stepping stones while trying to outrun a lightning storm and ending up taking a good soaking, so we opted to drop off early and pick up the much drier path that would take us out of Coire Ardair. This turned out not to be so easy, either. We skirted the Sron a’ Choire crags only to encounter steep, surprisingly solid, fields of snow which sometimes entailed bum slides using the ice axe as a brake, and crampons to traverse across deep gullies. We were relieved to eventually reach the path in the lower corrie. It was a gentle end to an intense day, a fitting finish to a tiptoe between the cornices on two stunning mountains.